#7260 Smooshees Critter Cuddlers "Tops The Pup"
Description: The "Tops the Pup" set includes a Smooshee dog, and a tiny fire hydrant that the pup can be smooshed into. This is one of several friendly Smooshee pets called Critter Cuddlers that were sold with a natural habitat they can be smooshed into. Designed for children ages 4 years and older. FPT14941 - Tops the Pup - Small stuffed Smooshee puppy dog with a printed face and other features. Her face has purple eyes, a pink nose and a black line mouth with a pink tongue in the center. Tops has a white body covered in light purple polka-dots, long light purple ears with white inner ears and light purple legs with pink pads on the bottom. She has a blue printed collar with a pink line across the top and bottom and a line of pink hearts in the center. She has a pink fabric bow between her ears. 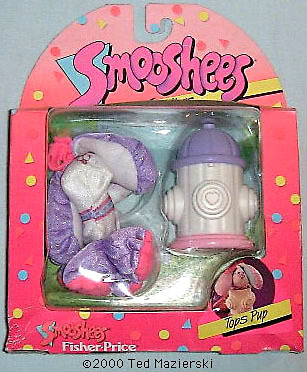 She is not marked with a model number, but was sold with a small sewn-on tag marked with a "S" for Smooshees. FPT14942 - Small round white fire hydrant with a round pink base and a round open top. One side of the hydrant has a rounded door hole and the other 3 sides of the hydrant have rounded molded rings with a raised molded heart in the center. FPT14943 - Rounded purple fire hydrant dome top that fits on top of the white FPT14942 fire hydrant base. The top has a raised heart shape in the center. The side has an attached ring that fits around the top of the hydrant base.